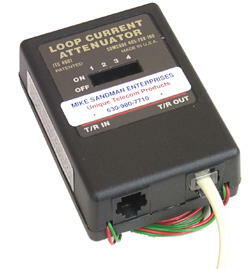 Our Loop Current Regulator™ automatically keeps the Loop Current on a line at 25ma - no matter what! No dip switches, no meter, just plug it in! If the Loop Current changes down the road, the Loop Current Regulator automatically adjusts. Includes a BUSY (Line In-Use) LED that lights whenever anything in-series with the Loop Current Regulator™ goes off-hook. 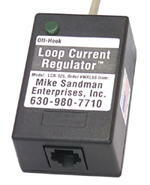 Our Loop Current Regulator™ is a cost effective fix to High Loop Current Problems. Specially made so that it WON'T bring down the volume of the line as it reduces the Loop Current. Your customer will be able to hear even if the Loop Current Regulator™ is reducing the Loop Current by 80ma! Each 1 Line Modular Loop Current Regulator™ can be plugged directly into a modular jack (RJ11), with the telephone equipment plugged into its jack. It can also be hardwired to a 66 Block by cutting the twisted pair cable going to the modular plug in the middle, and punching the one pair from each of the two cut ends down to the 66 Block (the plug side to the phone line, and the Regulator side to the phone equipment). just got to reduce the Loop Current to see if the problem clears. The reason that high Loop Current causes different problems on different systems, and different problems depending on how high the Loop Current is, is that high Loop Current produces heat. Once the electronic components in a circuit get hotter than what they're rated to work at, strange problems start popping up. The problems are going to be different on every different model and brand of phone system, and at different premises, because there will be more or less Loop Current effecting different sets of components in the various systems. More information on Loop Current is available in our Loop Current and Circuit Loss Tech Bulletin. If you need to test loop current to see if it's high or low, use a meter with a DC ma range or use our Loop Current Tester.